Our neighbors across the fence gave us two sacks of beets today and some zucchini. So today for lunch, we sat down to some plain steamed greens with a little salt and butter. What luxury. The simplest of greens, so delicious. It's great to have neighbors who give you more than zucchini. The trouble is, I never have anything they are interested in trying. I'd love to share something I've grown with them. Oh well. I was thinking the beet greens would probably substitute nicely in Craig's swiss chard recipe. Have you ever received a gift of produce across the fence you really appreciated? Today those greens were just perfect. Yummm! I love beet greens, especially when there is a baby beet still attached. I love beets too. When I'm pregnant it is one of the things I crave. I'll open up a can of beets and eat the whole thing for me dinner. I'm usually the one giving stuff away. My neighbor is nice and though we usually have similar things growing she'll share whatever she has that I don't and vice versa. I got some beautiful lettuce from her the beginning of June, and Cilantro. I get Jalapeno peppers from her when I make salsa. I love everything anybody gives me, even a scallion! People have given me some things I especially liked--their own marinara sauce, dilly beans, pickles, etc, but my favorite is my grandma's red currant jelly! That's a special treat! I love giving and getting. Today the same neighbors gave me more beets, onions, carrots and zucchini. Yum. One of the zukes got grilled tonight. I plan on doing that tart tomorrow with the beet greens. Maybe make some pickled beets too. I have lots of fresh garlic, herbs, some cucumbers that I could share with the neighbors, but their tastes aren't as adventurous as mine, and their stomachs don't tolerate some things I guess. No tomatoes yet. They will be late for everyone in my area it seems. Even my neighbors across the fence have only had a couple ripe ones. They have 3-4 more hours of sunlight than me, those lucky ducks! I love our trees up here, but they do get in the way of growing a summer garden sometimes. My garden is surrounded by neighbors' trees. C'est la vie. Made Craig's Swiss Chard tart using the beet greens. Excellent. I did substitute other ingredients too, as I did not have everything. A forgiving tart, and I recommend it. Here's a really simple recipe. No measuring. You'll just have to eye it. Chop up as many washed beet greens as you think your family will eat. Chop up several green onions-also known as scallions. Chop them fine or in chunks. Chop up a summer squash or part of one. Your choice. However you like them. Chop a clove of garlic fine. Chop some fresh basil or get out some frozen or your jar of dried basil. Get out some sun dried tomatoes packed in oil, or use fresh. I don't have any fresh yet. Use whatever you think will work for your family. Get out some thin sliced ham. Your choice. Saute it gently in a pan. When it's done, take it out and chop it into little pieces. Now add the vegetables to the pan the ham was in. Pour a little water, wine or stock into the pan. It will take a minute or two for the vegetables to cook because they are diced fine. Your pasta should be almost done. Stir the cooked ham into the vegetables. Drain your pasta and dish it out on plates. If you want you can add a tiny bit of olive oil or I Can't Believe It's Not Butter Spray or nothing. Your call. Now spoon out the vegetables and ham on the pasta. Sprinkle with your best parmesan, a lot or a little. It should be to your taste. The kids and cranky adults will eat this, although your findings may be different. I found this in the Care2 Newsletter and tried it last weekend. I didn't have enough pears so added some honey crisp apples along with the pears and parsnips in the roast pan. I found it very hearty. You can thin it down as much as you want with stock. If you wish, use vegetable stock and tofu if you want to go vegetarian/vegan. We had it with warm from the oven, crusty sour dough bread. Yummm. Too bad its all gone. I think I'll have to make more.....soon. 1. Position rack in lower third of oven; preheat to 450 F.
2. Toss parsnips, pears, onion, oil, 1/2 teaspoon salt and pepper in a roasting pan. Roast, stirring every 10 minutes, until very soft and starting to brown, about 40 minutes. 3. Meanwhile, boil vinegar in a small saucepan until syrupy and reduced to about 1/4 cup, 10 to 14 minutes. (Watch the syrup carefully during the last few minutes of reducing to prevent burning.) Remove from the heat. 4. Puree half of the parsnip mixture with broth in a blender until very smooth; transfer to a large saucepan. Puree the other half with milk until very smooth. Add to the saucepan and stir in the remaining 1/2 teaspoon salt. 5. Reheat the soup over medium heat, stirring often, about 5 minutes. Gently reheat the balsamic syrup if it has become thicker than syrup while standing. 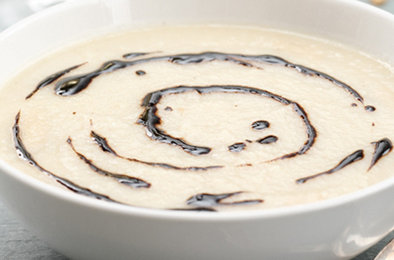 Ladle the soup into bowls and drizzle with the balsamic syrup. Tip: Remove the fibrous, woody core of parsnips before using–quarter parsnip lengthwise and cut out the core with a paring knife. Makes 6 servings, generous 1 cup each. Nutrition per serving: 250 calories; 4 g fat (1 g saturated fat, 2g mono unsaturated fat); 8 mg cholesterol; 49 g carbohydrates; 7 g protein; 9 g fiber; 515 mg sodium; 687 mg potassium. Nutrition bonus: Vitamin C (50% daily value), Folate (27% dv), Calcium & Potassium (19% dv). Exchanges: 2 starch, 1/2 fruit, 1/2 low-fat milk, 1/2 fat. I sampled Parsnip Pancakes at a cookware demo at a trade show. Really tasty!! Place parsnips in a large saucepan and cover with water; add salt. Bring to a boil over medium-high heat. Reduce heat; cover and cook for 15-20 minutes or until tender. Drain and place parsnips in a large bowl; mash. Stir in the onion, flour, egg and chives. Drop batter by 1/4 cupfuls onto a well-greased hot griddle. Flatten with a spatula. Fry until golden brown; turn and cook until second side is lightly browned. Drain on paper towels. We rarely had parsnips growing up, but when we did, it was always in soup or stew. My dad loved parsnips this way. My mom had never heard of them until my dad started using them. Similar to the OP, I peel and slice them, put them in a skillet with 1 inch of water and simmer until they are just starting to soften. Then I drain the water and crank up the heat and add butter, oil, salt, and pepper and essentially fry them. Parsnips are heaven on earth. I love parsnips in winter soups and stews. They add a sweetness that's different from the sweet flavor of carrots and winter squash, but complementary. I made a wonderful lentil stew recently. Put 1 cup lentils and 2-3 cups water in 6 qt. pot, bring to a boil, and simmer about a half hour. While lentils are simmering, chop up several stalks of celery (including leaves), a few parsnips, a few carrots, and some winter squash (or add already baked winter squash at the end of cooking time). Add chopped vegetables to pot (it should be almost full) and simmer another 10-15 minutes or so. I also had a big bunch of kale from the garden, so I sliced thinly and mixed it in just before I turned off the heat. It was ambrosial! And even better the next day. Our favorite way to eat them is well washed, rolled in a little sea salt, and eaten raw with the tops still attached. My boys gobble them up this way like they are the best thing in the world, and they prefer them to fresh carrots most of the time. 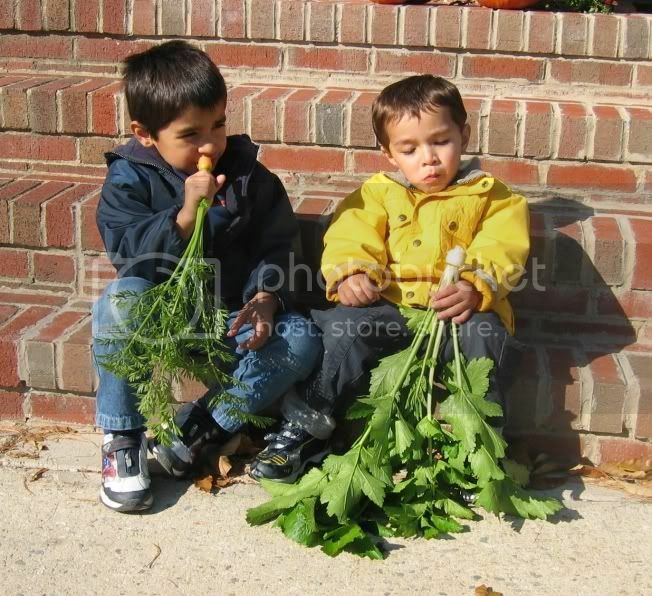 It is a highlight of our short winter days heading out to the parsnip patch to grab a snack. They do have to be fairly small/young though- mine are best when less than an inch across the top. My parsnips were all eaten by deer this year just as they started to take off. What a shame! •	Cut off stalks to within one inch of the beet. Wash beets and boil them for thirty minutes or until they are firm but not too soft. Drain beets and peel them when cooled. •	Grate beets into a bowl, using a medium grate. Blend in walnuts. Combine garlic, salt and vinegar and mix into the beet mixture. •	Spoon into shallow dish and refrigerate. Garnish with minced parsley prior to serving. •	I’ve used pecans or almond slivers instead of walnuts. •	Adjust amount of garlic as per your taste. •	I’ve used minced cilantro instead of parsley. •	I’ve also added baby radish leaves or arugula to the dish for an added peppery flavour and crunch. Or they could be the actual pasta dough recipes. I use a basic vegetable pasta recipe. It uses different purees such as beets, carrots, and spinach. I don't actually have a recipe for the butternut squash. I just decided that I don't have to limit myself to these 3 veggies. There is a whole world of veggies and fruits that could work. How about a combo of veggies and/or fruits. The one thing you should know is that the vegetable pastas have a subtle veggie flavor. For a more pronounced vegetable flavor try using vegetable based sauces. Pumpkin doesn't really have much flavor. What we usually associate with the pumpkin flavor is actually the spices we use when making pies. I also have recipes for a chocolate pasta and lemon pasta. I can look them up if you are interested. Can you imagine chocolate spaghetti with a cherry sauce or some Black Forest jam topped with a bit of whipped cream? How about chocolate ravioli with cherry pie filling. Or, raspberry ravioli plated on top of raspberry sauce served warm topped with a small scoop of french vanilla ice cream? Enough of that. Back to the butternut squash pasta. This recipe makes about 1 pound of pasta. You can use it for noodles, spaghetti, lasagna squares, or ravioli. 1.Preheat oven to 375 degrees. Toss beets with oil and a large pinch of salt. Wrap tightly in a parchment-lined piece of foil, and place on a baking sheet. Roast until tender, 45 minutes to 1 hour. Let cool. Rub beets with paper towels to remove skins. Puree in a food processor (you should have 1/2 cup puree). 2.Add eggs and yolk to puree in food processor, and process until combined. Add flour and 1 heaping teaspoon salt, and process until dough just comes together, about 20 seconds. 3.Transfer dough to a well-floured surface. Knead until smooth and elastic, 5 to 10 minutes, adding up to 2 tablespoons flour if dough is sticky. Place on a piece of parchment and cover with an inverted bowl, or wrap tightly in plastic; let rest for 1 to 2 hours. 4.Cut dough into 8 pieces. Working with 1 piece at a time (keep the remaining pieces covered with the inverted bowl), flatten dough into an oblong shape slightly thinner than the pasta machine's widest setting (number 1). Dust dough very lightly with flour, and feed through machine. Fold lengthwise into thirds and rotate 90 degrees. Repeat twice on same setting to smooth dough and increase its elasticity. 5.Turn the dial to next narrower setting. Pass dough through twice, gently supporting it with your palm. Continue to press dough, passing it through ever-finer settings, two passes on each setting, until sheet is almost translucent and very thin but still intact (number 5 of 8 on a KitchenAid pasta roller). The dough will stretch to about 16 inches long. If dough bubbles or tears, pass it through again, and dust with flour if the dough is sticking. 6.For farfalle, lasagna squares, or ravioli: Place rolled sheet on a lightly floured surface, and cut into desired shape, using a dry brush to dust flour off if needed. Cook according to corresponding recipe. For ribbon pastas: Place dough on a drying rack until slightly tacky, 10 to 15 minutes, and then cut into strands using a pasta machine, cutting attachment, or by hand. Drape over rack until strands are semidry and don't stick together, about 20 minutes. Cook immediately, or lay in a single layer on a baking sheet dusted with semolina, cover tightly with plastic wrap, and refrigerate overnight. Add 2 inches of water to a medium saucepan, and fit with a steamer insert. Bring to a simmer. Add carrots; cover, and steam until softened, about 10 minutes. Puree carrots in a food processor (you should have about 1/2 cup puree). Proceed with steps 2 thru 6 of the Fresh Beet Pasta Dough recipe. Add 6 ounces spinach, cover, and steam until bright green and softened, about 2 minutes. Squeeze out liquid using a clean kitchen towel or paper towels. Puree spinach in a food processor (you should have about 1/2 cup puree). ~ I got this from one of the recipe newsletters I subscribe to, and sorry, but can’t remember which one.